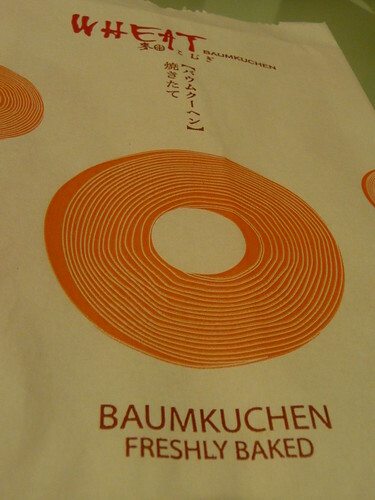 Baum Kuchen literally translates to mean Tree Cake in English. Despite having spent quite some time in Austria, this is the first time I came across this cake. The cake resembles the growth ring of a crosscut tree and the baking process is even more interesting. It is somewhat similar to kueh lapis where a thin layer of batter poured into a baking tin is allowed to be baked before adding on the next layer. 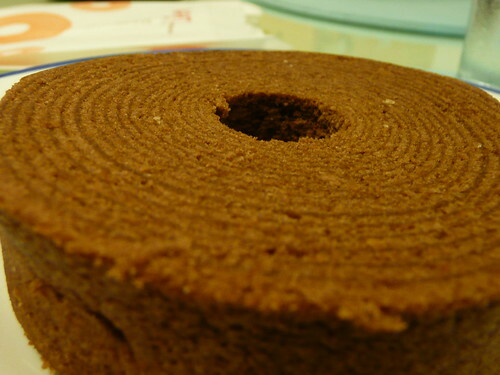 However, in the case of the Baum Kuchen, the batter is brushed onto a spit which is rotated around a heat source. Once the outer layer is baked, the next layer of batter would be applied until the ring grows to the size of one's desire. 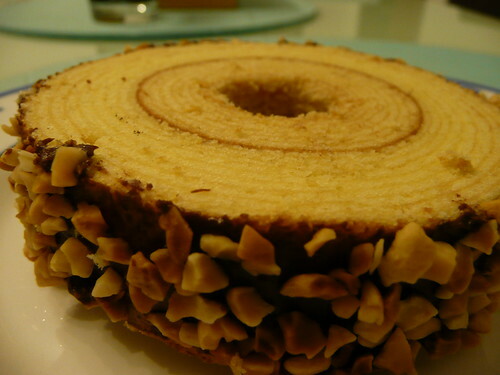 I happened to chance upon the shop, Wheat Baumkuchen, at Toa Payoh Central (Blk 190 Lorong 6, Toa Payoh #01-530) and thought that it stands out from the rest of the typical neighbourhood shops surrounding it. I would have thought that this is yet another business idea brought in from Europe but was surprised to find Japanese wordings on the paper bag. My curiosity got the better of me and a quick search online revealed that the cake was first introduced to Japan by a German in 1919, shortly after World War 1, which subsequently grew to become a popular pastry in Japan today. I purchased 3 flavors - Original, Chocolate and Original with Nutella & Nuts coating. Both the Original and Chocolate flavored cakes tasted rather plain and dry. Truth be told, I would rather prefer a spongecake. The last piece tasted much better probably due to its coating which gives it a rich chocolately and crunchy texture. I'll surely be back for more but only the ones with coatings or toppings on it. Root Beer Float @ New York New York!